After a meeting with clubs from around the region, it was agreed that there was not enough opportunities of Basketball for players at junior level to play 'ball, unless it was for National League. So we decided to do something about it! In May of 2014, the YBL was formed, officially known as the Youth Basketball League. The YBL's main purpose is to offer youth basketball to everyone and spread the game far and wide. The YBL offers competitive Basketball to different age groups within a league structure. The first season of the newly formed YBL was the 2014/2015 season. With a committee set up of volunteers from clubs at the meeting, in which we set in motion a chain of events that would change the shape of Basketball within the region. These volunteers used their passion and vision to shape the game into a new direction, giving more opportunities to those who love to play the game. The 2014/2015 YBL season offered Under 12, Under 14, Under 16 and Under 19 leagues accumulating in the first YBL Championship Finals held at UCB Perry Barr (Birmingham) in June of 2015. For the 2015/2016 season, the YBL committee decided to expand on the previous season and go with a slightly different format; offering Under 11, Under 13, Under 15, Under 17 and Under 19s. The YBL then held a weekend of the YBL Championships, calling it 'The Big Weekend' at the Wellbeing Centre (Nechells), Birmingham in the May of 2016. The 2016/2017 season was another success for the YBL, with an increase on team participation in most age groups, as well as new clubs joining an ever expanding YBL family. The Big Weekend 2 was a monumental end to the season; with a superb Semi-Final and Final. Going from strength to strength and looking forward into the fourth season, the YBL have made two more steps into the right direction. The first; adding two more leagues for the 2017/2018 season: Under 15 Girls and the WM/YBL (West Midlands/Youth Basketball League) Development League, which has already seen great interest. The second has been making the YBL into a non-profit organisation. The YBL, going forward will be called; Youth Basketball League C.I.C (Community Interest Company), but to its close friends and clubs; we’re still the YBL! With our ever expanding family; the YBL is looking for another year of great basketball. Great to see everyone out in force today, with ten teams with their coaches and supporters coming to battle for a spot in the Championship Finals. Everyone had a spectacular day with some great games, the supporters adding to the already great ambiance that the teams were giving out. The Under 11s kicked of the day with two very difference games, with City of Birmingham Rockers taking on Coventry Tornadoes 2 and Bromsgrove Bears taking on Coventry Tornadoes. CoB Rockets pushed hard from the start to secure their place in the Finals, beating second place U11 South team Tornadoes 2 with an impressive win. However, it was the other game that had peoples’ eyes glued, as the one-point game drew the most excitement from parents and spectators alike. Right down to the last few seconds, both sides were giving it their all. But it was Coventry Tornadoes who secured their place in the Final after the one-point win over Bromsgrove Bears. Coventry Tornadoes now take on CoB Rockets in the Finals. After a slight delay, the U13 teams got to the court, with CoB Rockets taking on last year’s U13 Champions; Leicester Riders. CoB Rockets guaranteed their spot by getting the impressive win over Leicester. Rockets’ take on underdogs Warwickshire Hawks, as they beat Leadonites in a nine-point game, coming from behind just after the start of the third quarter. Under 15s got the nail-biting awards for the most exciting games of the day as both Semi-Finals games were tremendously close and hard fought for! West Brom and Bournville Bears battled in the first half, with a close point for point game, however, West Brom were triumphant with a thirteen-point win. Bournville fighting until the end. Frankley Falcons secured their place after a six-point win over WBA D-Squad. Mirroring the other U15’s game, the fight never stopped. Newcomers Coventry Sky Blue took on Bournville Bears after their debut season in the YBL and showed they deserved to be there as they gave Bournville Bears a run for their money, in the first of the U17 Semi-Finals. Sky Blue continued to put the pressure on Bournville. However, the close-knit Bears’ side proved victorious as they secured their spot beating Sky Blue by twenty-three points by the time the final buzzer sounded. 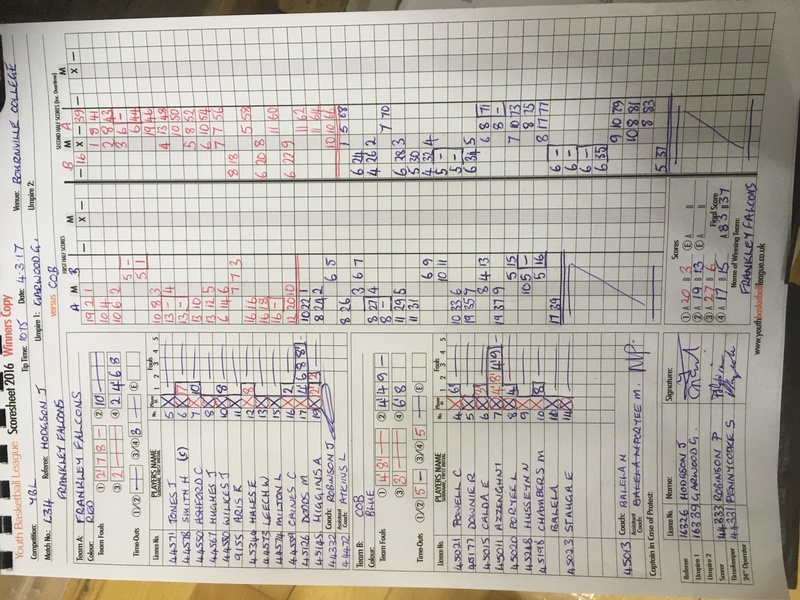 The second U17 game took spectators anxiety to another level as the two-point basket-for-basket game saw West Brom and Redditch Royals battle right until the last shot. With Redditch securing their place in the final against Bournville Bears. We finished off the day with the Under 19s teams’ Semi-Finals where WBA D-Squad played Nuneaton Predators. The strong WBA team secured their win over Nuneaton, with Nuneaton never giving up until the end. Yardley Defenders played Bromsgrove Bears in a close first half game. Bromsgrove slowing taking the lead in the second half and securing their win. Bromsgrove take on WBA D-Squad in the finals in three weeks time. All the teams made their coaches proud today with a great display of team work and determination. A big thank you to the teams, the players and their spectators for contributing to the great atmosphere throughout the day. A great day had by all. A special thank you to the YBL Committee for giving up their time today and contributing to another successful YBL event. See you all at the Cup or Championship Finals. The memories of the The Big Weekend are slowly fading into Basketball history, as teams battled it out in the second YBL Championship Semi-Finals and Finals. Clubs and their players are still talking about the excitement of the games and the atmosphere of the weekend. “Very well organised,” quoted one parent from Worcester Wolves. “It’s a pleasure to be here,” one coach commented. Spectators and coaches alike were just as excited as their players to be a part of the YBL Championship Semi-Finals and Finals: The Big Weekend. The Semi-Finals kicked off with the youngest of the YBL teams with two very well drilled teams. Over on Court 1 we saw the U11 League Winners City of Birmingham A take on newly formed Redditch Rockets. The game flowed nicely for the first few minutes, until CoB took the lead and kept it for the reminder of the game. CoB A 75 – 13 Redditch Rockets. On Court 2 we saw Worcester Bears and Coventry Tornadoes battle it out for a Final spot. A close and exciting game for all watching. Coventry Tornadoes just got the win (37-35) over a strong Worcester Bears. The Under 13s were next up and most people were more excited to see this age group as all throughout the season the teams were not as clear cut as to who was going to win. Teams were jumping all over each other in the table as they played decent and not so decent games during league games. League Winners Worcester Wolves took on Bournville Bears in the Semi-Finals which saw the Wolves U13 secure their Finals spot with a 57 - 45 win over Bournville Bears. Bromsgrove Bears took on City of Birmingham U13s on the other court in another gripping game. CoB wasn’t as successful as their U11 counterparts as Bromsgrove Bears took home the win! 53-42. Newcomers Frankley Falcons took on the strong Redditch Rockets in their Semi-Final game bringing with them a troupe of cheerleaders! It was a close game with Falcons getting the 52 – 48 win over the Rockets. Coventry Tornadoes took on their closest rivals Coventry Trojans in the first derby the day in the Under 17 Semi-Finals. In a close quartered game Tornadoes took the win to secure their place over Trojans (45-40) in the Final. Frankley Falcons U17s unfortunately lost their Semi-Final game to West Bromwich 44-65. Both games giving the players some superb game time and experience in high octane games. Ending a great day, the Under 19’s semifinalists were up. Both derby games, the first, on Court 1 saw second time U19 League Winners Bromsgrove Blaze take on Bromsgrove Bears. A tight, nail biting and tense game on both sides as it was basket for basket. Blaze got that extra basket as they beat Bears 62-60 to secure their place in the Finals. Over on Court 2 we saw West Bromwich Basketball Club take on new comers to the YBL, Sporting Club Albion. Another great and intense game. The well drilled teams continue to battle for the win as were basket for basket until the end of the first half. It was the second half that West Bromwich took the lead and beat the good Sporting Club Albion 70-52. The first half of The Big Weekend complete, with tired and excited players and coaches and a few disappointed ones. It was time to rest before the big day they had ahead of them. The second early start for all came around quickly as the Sunday started with the Under 11 Finals which saw City of Birmingham A take on Coventry Tornadoes. The strong CoB team dominated the game from the outset and continued their winning streak throughout the game. Defeating the Coventry team 46-26. Bromsgrove Bears took on Worcester Wolves in the U13 Finals. Both dominate teams press and played some decent defense, however it was the Bears’ team work that got them to victory as they beat the U13 League Winner Worcester Wolves 54-37. The game of the weekend must have been the U15s final between Frankley Falcons and Yardley Defenders. Nail biting and tense does not do the game justice. As both teams were there to gain the U15 title and they were both going down fighting to make sure they got it. Basket for basket for most of the game, it wasn’t until the fourth quarter and the final few minutes that the skill from both teams continued to shine. Both Yardley and Frankley had the crowd on their feet as basket after basket was hitting the net. But it came down to the last few seconds when both teams were equal and the buzzer beater basket was played by a Falcons player. Frankley beat Yardley by two on the final buzzer 50-48. Where is Sky Sports when you need them? Coventry Tornadoes’ second team in the final came when they took on West Bromwich in the Under 17 Finals. After a slow start both teams got the momentum they needed to score some points. However, it was West Bromwich who took the lead early in the third and kept it until the final buzzer. West Bromwich beating Coventry Tornadoes U17s 70 to 52. The YBL Championships The Big Weekend came to a close with the Under 19s final where we saw Bromsgrove Blaze, already holding last season U19 Championship Title, take on West Bromwich. In a close quartered game, both teams played superbly throughout a tough game. When it came down to the final minutes it was Blaze who took baskets and defending theirs from West Bromwich. Blaze won 77-70. It was a great weekend for all and I hope that everyone who took part enjoyed themselves? Congratulations to the winning teams and their coaches. I would like to congratulate Nick Gibbs for receiving the first ever YBL Chairperson Young Adult Special Recognition Award 2016 for services to Basketball at a young age. Not only does Nick play for two YBL clubs in different age groups, he has also branched out into the field of refereeing. Reports from clubs and officials throughout the region have been genuinely positive and encouraging. It's nice to see a player grow. Not only is he a full time 'baller and referee, but Nick is studying for his GCSEs. Well done Nick for all your hard work and good luck in your exams! I would like to take this opportunity to thank several people for their continued support of the YBL and the YBL Finals. Firstly, the YBL Committee who alongside myself have put a lot of work into making the league and The Big Weekend such a huge success. Their continued support and their hard work makes all this possible. Thank you to Roy Francis and Alexandra Livadiotis for organising the referees and table officials, respectively, on the day. Without their help the day wouldn’t have run as smoothly as it did. Also to the many referees and table officials themselves, who gave up their time and officiated in some of the best Basketball games in the region! Finally, thanks to Cole for his help as a runner for the two days. We estimated that over the two days there must have been around a thousand people. A first for this level of Basketball. It shows that with all the clubs around the region, all the coaches, the volunteers, the parents and the players. We all come together for something that we love. Basketball. The region, including teams from the West Midlands, Coventry and Warwickshire, Shropshire and Hereford and Worcester have excellent talent. This was clearly shown in the YBL Finals. While some players and their families are winding down for the Summer break, the YBL Committee and clubs are getting ready for another season of Basketball, which is only a few months away now. We are already accepting club and team applications! You can see all of the highlights of The Big Weekend and all of the information you’ll need for the upcoming season on our website. The first YBL Championships Finals games took place on at The Doug Ellis Sports Centre in Perry Barr, with great success. All the teams that attended gave their parents and their teams’ spectators some entertaining basketball. There was a great atmosphere throughout the day with a lot of fun had by all. The first game, our Under 12s, started the day off with a bang. City of Birmingham took home the first YBL U12’s win, 50-12, against their opponent Tornadoes Basketball. It was the second game of the day that really started to get the spectators going with a very close game (the closest of the finals). Tornadoes narrowly missing out to Redditch’s Under 14 squad by four points. Despite having the lead for most of the game. Redditch won 45-41. City of Birmingham took on Redditch Basketball in the U16 clash. With CoB taking the lead, and keeping it near the end of the first quarter. CoB won 104 to 37. The final game of the YBL Finals saw close derby rivals, Bromsgrove Blaze take on Redditch Basketball in a gripping finish to the day. Holding ground for both teams until half time, with only a six point gap between the two teams. The second half saw Blaze slowly take that gap bigger, at one point with a twenty two point difference. Redditch slowly brought that gap down. Bromsgrove Blaze won 73-60. It’s been a great first season for the YBL and that has shone through today in the YBL Championship Finals. A big thank you to all of the referees and table officials who took part today, Roy Francis and Alexandra Livadiotis who over saw the officials. Plus a big shout out to the YBL Committee for orgainising the event. Enjoy your ‘off’ season and we’ll see you all in September.